Fun fact: According to several sources, Chance the Rapper has seen The Lion King on Broadway like 20 times. Adorbz. If you haven't already heard about the Chi-Town native, chances are, you will soon. (See what I did there?) He's been making major waves on the music scene ever since the 2013 release of his double platinum mix tape Acid Rap. There's a lot you can say about Chance—his lyrics are smart (while not always PC), his musicality is on point, his taste is eclectic—but the most striking thing about him is his appetite for working with other artists within the music world and beyond. Case in point: In addition to his solo work, Chance is a member of a group called The Social Experiment, which includes trumpet aficionado Nico Segal, aka Donnie Trumpet. 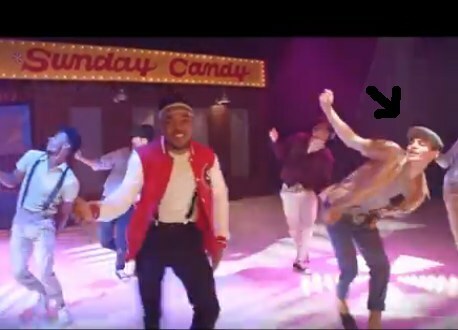 Last month, the crew released a short film featuring the song "Sunday Candy," directed by Chance, Austin Vesely and a guy by the name of Ian Eastwood. That's right—the PULSE on Tour idol, hip-hop video expert, Dance Spirit 2014 Hot Young Choreographer, soon-to-be movie star, Ian Eastwood. That's Eastwood boogying with Chance the Rapper. Casual. Naturally, Eastwood also served as head choreographer and dancer for the project. And we we were thrilled to see this multifaceted dance maker show off yet another side of his creative brain. You see, Chance wanted the production to be heavily theatrical. (Apparently he was inspired by long hours spent in The Lion King audience...) Eastwood expertly molded his characteristic old school swag into fast-paced, joyful, sweet-as-candy, bop-your-socks-off choreo that brought us straight back to the 1950s. Pair that with Chance's ever-clever lyrics and a gospel-inspired track, and you're guaranteed to smile like a goof for the entire three-minute-fifty-second video. Enjoy!